LONG ISLAND CITY — Officials broke ground on Hunters Point South Monday, marking the first residential construction phase of the massive Queens development — and one of the city's first waterfront projects to proceed post-Hurricane Sandy. "The first homes of Hunters Point South will be among the first units built along our waterfront since Hurricane Sandy," Mayor Michael Bloomberg said at a groundbreaking ceremony Monday afternoon. "Our administration has committed to not simply rebuilding the communities that Sandy hit the hardest, but to create a more resilient and sustainable city as well, and Hunters Point South will help us do both." The two buildings will rise at 1-50 50th Ave. and 1-55 Borden Ave. in Hunters Point, made up of 925 affordable housing units with several new design features to safeguard against potential future floods. The mechanical equipment for both buildings will be stored on the second floor or higher, emergency generators will be kept on the roof and the exterior doors will be watertight, the mayor said. "All the equipment is above ground," he said, saying that plans for the building were adjusted after Superstorm Sandy struck this fall, forcing changes to how the city builds along the waterfront. "Everybody always put them down in the basement because that was the most economic thing to do — anything above ground you could rent or occupy or sell, and so that was traditionally what had always been done." Adam Weinstein, president and CEO of Phipps Houses, the affordable housing developer involved on the project, said the original plans for Hunters Point South already called for the buildings to be constructed 10 feet above the flood plains. But Hurricane Sandy prompted them the add the additional storm-protection measures. "We felt it was important to make the effort to mitigate above that level," he said. "One hopes that this doesn’t occur again, but even if it does, at twice [or] two and a half times the level of Sandy, we’d be OK."
Even with the changes, Hunters Point South is ahead of schedule, Bloomberg said. When completed, the entire project will dramatically reshape this 30-acre site of underused Long Island City waterfront, establishing a new community of up to 5,000 housing units, 60 percent of which will be reserved for middle-income families. The project is the city's largest new affordable housing complex to be built since the 1970s. The first phase of the project, marked by Monday's groundbreaking, includes the two first residential buildings in addition to 17,000 square feet of retail space, a new 5-acre waterfront park and a 1,100-seat high school. The school, the future home of the Academy for Careers in Television and Film, is slated to open for the upcoming 2013-14 school year, officials said. The residential apartment buildings — one a 32-story tower, and the other a 37-story tower — should be ready for occupancy in 2014, officials said. All of the studios and one-, two-, and three-bedroom apartments in the first phase of the project will be affordable, targeted for low- and middle-income households. Housing officials on Tuesday said the units will rent from as low as $500 to a high of around $4,000 a month. 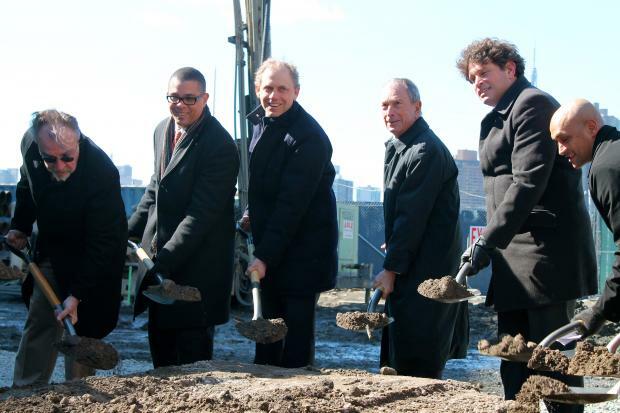 "Now is the time to get into Long Island City because it's just getting better and better," City Councilman Jimmy Van Bramer, who represents the area, said during the groundbreaking ceremony. Bloomberg said the city will issue a Request for Proposals next month for the second phase of Hunters Point South, which will consist of another 1,000 residential housing units, half of which will be designated affordable, in addition to 28,000 square feet of community and commercial space.